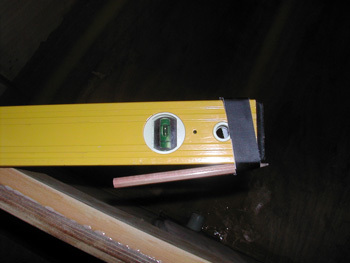 The first job on the hull after it was cleaned was to bond the propellor tube to each of the floor bulhheads. The white fabric is peel ply. 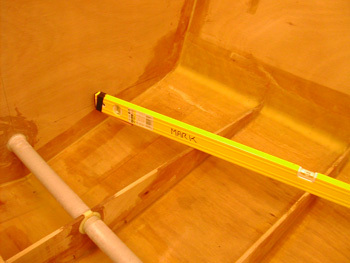 Then the height of the underside of the floor was marked on the forward and aft cockpit bulkheads ready for the timber floor supports to be fitted to those bulkheads. While I was doing this I discovered the second floor bulkhead was too high by about 1mm so I took the oportunity to resolve this. 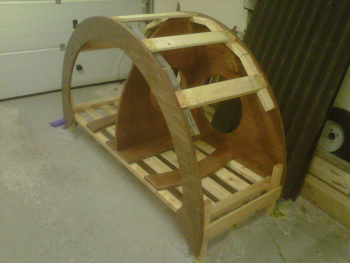 Meanwhile I finished the woodstore and gave it a coat of epoxy. I considered and started to fit an Onduline roof. 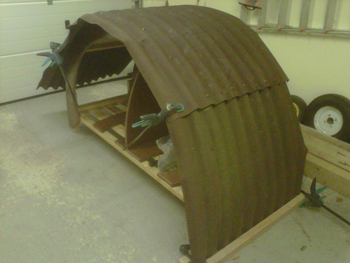 I had two panels left over from the workshop build and enough plastic capped nails to fix it on. The downside was twofold, I made a small miscalculation on the pitch of the roof ridges which required the Onduline to be stretched and this particular stuff is now 10 years old and has embrittled somewhat and a 1m dadius is rather tight... The result was a right mess and me stripping it all off back to bare frame. So next month it'll get a proper wooden roof. 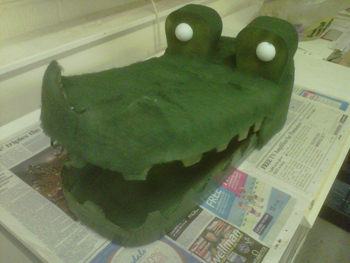 There was one other small distraction, a few props to be made for a local production of Peter Pan.